I am grateful to be back in your lovely city, and I am grateful for your invitation to speak today about the commons as a new vision of “development.” As the planet reels from the slow-motion catastrophe of climate change, we are seeing the distinct limits of the prevailing paradigms of economic thought, governance, law and politics. While collapse and catastrophe have their own lurid attraction to many, the human species – and our governments – have a duty to seriously entertain the questions: What new structures and logics will serve us better? How can we better meet basic human needs – not just materially, but socially and spiritually? And can we move beyond rhetoric and general abstractions to practical, concrete actions? After studying the commons for nearly twenty years as an independent scholar and activist, I have come to the conclusion that the commons hold great promise in answering these questions. But it is not a ready-made “solution” so much as a general paradigm and organizing perspective – embodied, fortunately, in thousands of instructive examples. The commons is a lens that helps us understand what it means to be a human being in meaningful relation to other people and to the Earth. This then becomes the standard by which we try to design our social institutions. Talking about the commons forces us to grapple with the checkered history of “development” policy and what it reveals about global capitalism and poorer, marginalized countries. We have long known that development objectives tend to reflect the political priorities of rich, industrialized western nations, particularly their interests in economic growth and private capital accumulation. Strangely, the once-heated political conflicts over the proper focus of development are starting to implode as new realities engulf them. The brute facts of climate change and the Sustainable Development Goals are calling into question the idealized models of economic development, transforming the very terms of debate. If we are to take the Paris climate accords seriously, the global North must now revisit its own historic mythologies of development and growth, and quickly imagine credible alternative paths forward. Suddenly, the social economies of indigenous peoples, traditional communities and localized systems seem highly relevant to the challenges ahead. The structural crisis of the global system, according to my colleague Michel Bauwens of the P2P Foundation, is its fundamental faith that the world’s natural resources are infinite. At the same time, the global economic system believes that knowledge and culture – which in the digital age are plentiful and virtually free to share – should be made artificially scarce. That is the point of copyright and patents, after all – to create artificial monopolies over knowledge, seeds, software code and much else, on the assumption that only artificial scarcity and profit will produce the goods that we need. History has shown that development discourse is a shape-shifting trickster, constantly adapting its linguistic face to accommodate shifting political winds. We’ve seen the rise and disappearance of participatory development….integrated development….endogenous development…. redevelopment….and now, sustainable development. (I’m sure I’ve missed some!) How much longer can this go on? As our climate and social crises intensify, we cannot merely look for another re-branding strategy for “development” to disguise hyper-marketization strategies such as REDD [Reducing emissions from deforestation and forest degradation], patents for genes and lifeforms, and financial instruments to securitize flows of nature. I submit that we need to take a longer view and abandon the whole mindset of “development” itself. I have no illusions that this shift will occur easily or happily; too many generations have been invested in these ideas. But without a very different conceptualization and lexicon for improving the human condition, we will continue to flail at our problems and sink deeper into dysfunction. To start, I propose that we start talking about human flourishing, not “development,” so that the social relationships ordained by markets are not the default or exclusive norms. Let’s also stipulate that our foremost priorities should be meeting ecological and human needs, not propping up an unsustainable economy based on extraction, growth, expansive private property rights, and capital accumulation for the few. Markets remain vital, of course, but markets should be in the service of regions and communities, not absentee finance and investment. To achieve this, we must begin to give due recognition to the vital importance of nonmarket forces that exist outside of “the economy” – that is, to the intrinsic value generated by natural ecosystems, place-based communities, care work, digital collaborators and other self-organized commoners. These are realms of aliveness and value-creation that standard economics ignores or misconstrues. But if we can bring them into a constructive realignment with the behaviors and institutions that we call “the economy” – crafting markets that respect the commons – we could unleash enormous human energies while building a better world. In my remarks today, I’d like to explain how the commons can serve as a powerful shared imaginary that can take us beyond “development.” It provides a realistic framework to invent different means of provisioning and governance, with a more humane, socially equitable and ecologically responsible logic. It’s important to understand that the commons is not a PR gambit or “messaging strategy” for giving a fresh face to leftist politics or development policy. Nor is it a political ideology or policy agenda as such; it’s an evolving, open-ended discourse and creative social action. The commons is an invitation to a collaborative process, not a declaration of universal answers. It is something that must be socially enacted from the bottom up. It is not something that benevolent nations and technical experts can impose; it can only be encouraged. Thomas Berry, the historian of cultures, once wrote, “The universe is the communion of subjects, not a collection of objects.” That is the sensibility that informs the commons. It’s all about honoring agency and aliveness of human beings, not objectifying them to serve as pawns in someone else’s design plan administered from afar or coerced through global finance. I see the commons as a quasi-autonomous realm for managing common wealth, especially at the local level, through a multitude of approaches. I believe the commons paradigm offers many promising, practical approaches for dealing with archaic economic ideas, inequality, precarious work, migration, climate change, the failures of representative democracy, bureaucracy. Personally, I am inspired by visionaries like Ivan Illich, E.F. Schumacher, Wendell Berry, Karl Polanyi, Lewis Hyde, Jane Jacobs and Aldo Leopold. Even though commons are often criticized as “wastelands” or “tragedies,” the truth is that they are generative. Commons quietly meet important household needs – the original goal of economics. They also disproportionately benefit women, who rely so much on commons to provide household food, care work and community. Natural systems, too, are more likely to be happily integrated with a culture of commoning than with the culture of global capitalism. For all these reasons, the commons can help us move beyond the problematic history of conventional development because it proffers different theories of value and human aspiration than those of the price system and the state. Seed-sharing is one way that local communities can assert greater control over their lives by controlling the knowledge that their lives depend on. I visited the village of Erakulapally, two hours outside of Hyderabad, India several years ago. I was deeply moved when I encountered Indian women who had revived the use of traditional agriculture with very old seeds that they found in their mother’s attics and storage chests. “Our seeds, our knowledge,” is how they spoke about the seeds, which cannot be sold. They can only be shared, borrowed or traded. Seeds have deep meaning in a woman’s life, and are a source of dignity. By recovering these seeds, which were more ecologically appropriate to their semi-arid region than the monoculture crops sold by multinational seed companies, they were able to improve their yields and provide two meals a day for their family instead of one. They also reduced their dependency on global markets and their volatile prices. Community lands in Africa – forests, rangelands, farmlands – have long been governed by custom as traditional commons. But many lands in Africa are under grave threat these days by an international land grab by foreign investors, especially sovereign states and hedge funds. Following the classical development paths to wealth creation, African states have colluded with investors to give sellers legal title to common lands, converting them into market assets. Land is being made a mere machine to produce food, a commodity to be managed by the “free market,” without regard for the famines, urban migrations and cultural desolation that will surely result. For hunter-gatherers, pastoralists and indigenous peoples, land is not a mere asset. It is “the foundation for shared culture, practical social security, and an ultimate bulwark against bad decisions and involuntary losses,” in the words of Liz Alden Wily, an African land specialist. The System for Rice Intensification is a global community of rice farmers who use the Internet to trade advice on agronomy practices for raising traditional rice – without GMOs, pesticides or herbicides. It amounts to a kind of open-source agriculture that engages farmers from Sri Lanka and Cuba to Indonesia and West Africa. I call it an “eco-digital commons” to emphasize how Internet collaborations and natural resources are integrated. The SRI methodology has increased yields by 20 to 50 percent, and often more, and made farmers more knowledgeable, active stewards of their land. The system has developed entirely outside of government ministries and markets, with helpful coordination by academics at Cornell University. The Potato Park in Peru is a “living library” of genetic knowledge about potatoes. This region near Cusco grows about 2,300 of the world’s 4,000 potato varieties, making it one of the most biodiverse regions on the planet. What’s remarkable is that the Quechua natives in the Sacred Valley of the Incas have secured legal recognition for their right to act as stewards of this biodiversity. They can manage their potatoes as sacred gifts without worrying about ag-biotech corporations trying to steal the genetic knowledge to patent it. The Potato Park model flourishes because it integrates agroecological practices with people’s spiritual traditions and cultural values, making it a holistic, regenerative system rather than an extractive market system. The city as a commons. While traditional “development” has focused on rural regions of the world, I think that we need to regard cities themselves as commons. A growing number of proven legal, administrative, social and digital innovations are empowering ordinary citydwellers to design the spaces and programs in their cities. One pioneering example is the Bologna Regulation for the Care and Regeneration of Urban Commons – a public/commons partnership by which the city government invites self-organized citizen groups and neighborhoods to take charge of parks, kindergartens, abandoned buildings, and more, with the active support of city government. Other urban commons include participatory budgeting; community charters for managing collective assets; multistakeholder cooperatives for social services; and urban land trusts to make housing more affordable. San Francisco has developed “urban prototyping,” a kind of open-source citizen participation for urban planning. There are also many experiments that are reinventing production value-chains so that the benefits can be mutualized for collective benefit, not privatized for investors – for example, global open design and manufacturing networks that use FabLabs and makerspaces as infrastructures for local production. These are just a few commons that I could cite. I could just as easily have mentioned agroecology and permaculture….water committees that manage public water supplies in Bolivia….community forests in India…..coastal fisheries managed as commons….the acequias for managing irrigation water in New Mexico…and many others. The International Land Association estimates that two billion people around the world depend upon forests, fisheries, farmland, water, wild game, and more, managed as commons, for their everyday subsistence. Amazingly, if you consult any introductory economics textbooks, you won’t find any mention of the commons as a social system. While some textbooks are daring enough to mention “common resources,” the authors are quick to reference the “tragedy of the commons” parable. Economists usually ignore the commons despite its enormous role in meeting basic needs because commons do not participate in the magic of the marketplace. There is usually no transfer of money, and no production of (monetized) wealth. So commons can be safely ignored as trivial and uninteresting. To be sure, not all subsistence commons are sustainable or well-functioning. Many are plagued by patriarchal norms and power abuses. Governance systems in commons can fail. The state may interfere on behalf of corrupt politicians or investors. 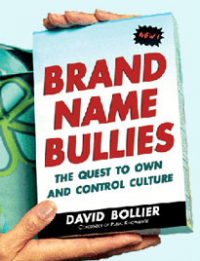 Bureaucrats may resent local commons as competing regimes of authority. Still, even with their problems, commons enable hundreds of millions of people to meet their everyday needs in ways that are fairly stable, resilient, ecologically respectful and culturally rooted. A recurring theme in so many commons is their ability to manage shared resources responsibly and at an appropriate scale. They can be effective, trusted and legitimate in ways that governments and markets often are not. The focal point in a commons is not the transaction, but ongoing relationships. Commons cultivate lasting social affections and obligations among people. Duties and entitlements are linked. Commoners care about earlier generations and future ones. Hardin was focused on the resource, and had little interest in exploring the empirical social realities of people or commons. The late Professor Elinor Ostrom helped rebut Hardin by documenting the many ways in which hundreds of communities, mostly in rural settings in poorer nations, do in fact manage natural resources sustainably. Sadly, economists, politicians and the public persist in seeing the commons simply as unowned resources. NATO routinely refers to the oceans, space and the Internet as commons, when in fact these are common-pool resources – resources that are threatened precisely because they are not yet governed as commons. Commoning consists of a distinct, active community that sets boundaries around the resource, negotiates rules of access and use, assigns responsibilities and entitlements, monitors for and punishes free riders and shirkers, and so on. So what many regard as a resource or as a social institution is more fruitfully understood as a dynamic, evolving social activity. Commoning is carried out by people who love and care about their resources, community and culture – sometimes because their very survival depends on it. 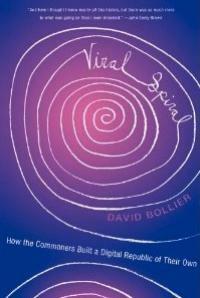 It helps to understand the commons as a living social system of creative, mutually committed agents. This third level of discourse is unsettling to conventional academics because it moves the entire discussion out of the familiar economistic framework based on Homo economicus. Instead of relying on a cardboard caricature about what a human being is – selfish, rational, utility-maximizing, and so on – we brashly welcome a more complex, open-ended idea of human capacities and character. Most economists are wary of entering the precincts of anthropology, psychology, sociology, geography, and other “soft,” humanistic sciences because they can’t build tidy quantitative, mechanical models that predict the future. When there are so many idiosyncratic local, historical, cultural, and intersubjective factors at play, as there are in a commons, it is virtually impossible to set forth a standard, universal typology of commons. Of course, this is precisely the point – to honor the natural, robust, unpredictable diversity and creativity of life itself, as it is actually lived on the ground. A commons does not attempt to subordinate the vagaries of history, social practices, geography, and culture to a universal market logic – to make everything a fungible commodity on a global grid. The commons paradigm seeks to leverage these attributes. Properly aligned, they are what make a commons work well. This third level of understanding commons is often disregarded because it frankly creates problems for certain sectors of society. Commoning requires that we begin to rethink the ontological framework of standard economics and go beyond the rational-actor premises of Homo economicus. It invites us to make a larger macro-political analysis of the structural deficiencies of markets and the state, and by favorable contrast, the generative power of commons. Needless to say, a lot of people just don’t want to go there. Once you start to take the commons seriously, a clash of worldviews is nearly inevitable. In a world of high modernity and global capitalism, where “everything solid melts into air,” as Marx put it, the commons is often seen as hopelessly premodern and even tribal. 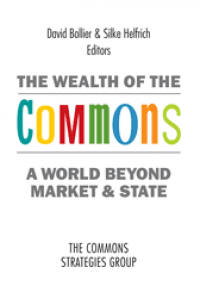 The commons insists that many things must remain inalienable – not for sale or commoditization. This enables commoners to preserve their humanity and the beloved landscapes and cultures that define their lives. Unfortunately, the state, bureaucratic systems and economics usually want to impose their own regularities on the messy local realities of human existence and social organization – a theme nicely explained by James Scott in his book Seeing Like a State. Commoning remains nearly invisible first because it is assumed that the state and market are the only governance structures worth talking about. Second, taxonomies that attempt to classify commons and make them more visible fail because the commons paradigm is not a regularity; each is distinctive. I have been astonished to discover, for example, that there are commons out there that revolve around community theater, the design of open-source microscopes, and neighborhood currencies in Kenya. There are commons based on open-source mapping to aid humanitarian rescue, and self-organized commons in Greece to provide hospitality for migrants. Once we recognize this fact, we start to move from abstract systems-thinking to a realm of experiential meaning. We must behold the mysteries of organic, living systems! Understanding living systems as living systems requires a more holistic perspective and humanistic values. It requires new heuristic methods. None of these are easily apprehended through the universal, mechanistic categories of western modernity. It becomes hard to see the commons when even language and law have been warped to banish the commons down a memory hole. I learned from Professor Benjamin Coriat of Université Paris 13 that the French Napoleonic civil code negated any form of common property when it went into effect in 1804. The French people had long managed forests, fisheries, farmland and lakes as commons, but the new civil law denied any form of common property. The juridical privileging of property rights, defined in terms of individuals, also served to override collective human rights because individual property rights in practice can be used to negate human rights. And so the commons begins to disappear from world consciousness, at least in the West. Let me illustrate this loss of a different way of being by showing you a map of the Great Sandy Desert in Australia. To the western mind, no surprises here. But now look at this same land mass, known to the Aborigines as Ngarrara. A very different landscape! The first map is gray and schematic. The second is a colorful, breathtaking work of art. Each embodies different ways of seeing, different relationships to the land, and different conceptions of human society. This is entirely normal in commons, where people’s relationships to each other and to their resources constitute the commons. The ontological variability of commons is supremely maddening and incomprehensible to economists and others living within the modernist worldview. No wonder most of them persist in regarding the commons simply as a resource! It’s as if they cannot abide the idea that everything cannot be classified into standard, operational categories, the sine qua non of neoliberal market culture. I do think there is a middle ground between the universalism of high modernity and the chaotic diversity of countless unique commons. There is a practical heuristic for making sense of commons, and it’s called patterns. This idea was developed by Christopher Alexander in the early 1970s through his brilliant analysis of pattern languages. Alexander wanted to know why certain architectural designs in buildings and public spaces have been so persistent and powerful over thousands of years. His conclusion, after studying an eclectic range of designs across cultures and centuries, was that certain patterns of design are used again and again because they are so elementally pleasing to humans and supportive of life. Certain patterns are not merely fashionable or profitable; they speak to something deeper and mysterious in human beings while meeting functional needs. Using this methodology, Alexander identified a coherent pattern language for architectural design. 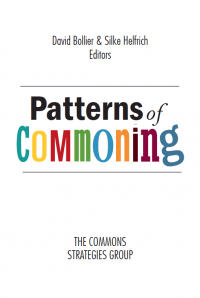 My colleague Silke Helfrich and I drew upon the idea of pattern languages in our recently published anthology, Patterns of Commoning, which features more than fifty examples of commons from around the world and in different resource domains. A pattern analysis allows us to identify recurrent types of design and governance within commons. The heuristic of patterns allows us to honor the particular social relations of each commons while letting us also draw general conclusions about a class of commons. There is no need to impose a false regularity on the crazy jumble of human life. I also think that fractal motifs help us understand the character of commons – differences are nested within self-same patterns. I realize that this is a bracing idea that is not easily absorbed by politics, policy, donors and agencies involved in development. But I think we need to entertain these realities. My colleague Silke Helfrich recently told a conference of commons scholars: “A coherent theory of the commons [that addresses relationality] could mean to social sciences what quantum physics meant to the natural sciences.” The power of relationality in commons may throw many deeply entrenched ideas into disarray, but it may also open up some breathtaking new vistas for deeper understanding and practical action. Leading evolutionary theorists such as David Sloan Wilson, E.O. Wilson and Martin Nowak and complexity theorist Samuel Bowles are confirming that reciprocal social exchange lies at the heart of any society. It is the basis for human identity, community and culture. Reciprocal exchange is a vital brain function that helps the human species survive and evolve. Theorists of natural selection are now spending a lot of time focusing on the dynamics of group selection over individual natural selection. As E.O. Wilson and David Sloan Wilson put it, “Selfishness beats altruism within groups. Altruistic groups beat selfish groups. Everything else is commentary.” David Sloan Wilson, who worked briefly with Elinor Ostrom before her death, has even founded a new organization, PROSOCIAL, to use the findings of evolutionary science to improve the functioning of organizations and communities. Other scientists such as German theoretical biologist Andreas Weber go even further, challenging the credibility of scientific method that has no place for subjectivity, consciousness, meaning and spirituality in the grand march of evolution. Modern science declines to study the aliveness inherent in all living creatures, complains Weber. It sees living organisms as sophisticated machines that can be more or less explained through cause-and-effect processes. The world is seen as governed by large, abstract forces, and human agency and consciousness are cast as trivial, ephemeral bubbles in an empty universe. These are the tacit metaphysical premises of the neoDarwinian grand narrative and of free-market ideology. I’ve given a lot of conceptual and philosophical framing here. Now let me suggest some practical steps that could help support commoning as a way to improve human flourishing. I don’t offer these as “magic bullets” that will solve challenges, but rather as important vectors for further research, debate and creative implementation. 1. Stop the enclosures. One lesson of the history of economic development is that the neoliberal idea of development and progress is the commoners’ experience of enclosure, dispossession and cultural loss. The process of privatization and marketization creates only certain forms of value while redistributing wealth and power and creating a lot of “illth,” in John Ruskin’s phrase – the opposite of wealth. We can see this with so many neoliberal trade treaties, the African land grabs, and neoextractivist politics and practices in Latin America. We see it in the facile conflation of Gross Domestic Product and human well-being. So the first step toward protecting commons is to stop the market enclosures of farmland, fisheries, forests, rangelands, water and other natural resources. These are destabilizing forces. They quite often serve the interests of global finance more than the long-term interests of local communities. 2. Recognize commoning as a regenerative paradigm that opens up new solution-sets. Instead of regarding the state and the market as the only consequential forces for improving human life, development policy needs to recognize commoning as generative and regenerative. It is a holistic framework that re-invests in a commons, helping to maintain it. It is not extractive of either resources or people. Its benefits belong to all commoners and can be mutualized among them. This is the very point of the commons – to introduce a new vocabulary to start to name things and social activities that the dominant financial paradigm has little interest in (primarily because nonmarket aspects of nature and care work have no price and therefore are treated as if they have no value). The social ethics of Buen vivir and Pachamama are attempts to bring a very different worldview into the foreground. The language of “affective labor,” as geographer Neera Singh puts it, is the kind of language that helps validate the importance of commoning. Stewardship charters such as the Potato Park can give a customary community enduring legal and administrative control over its land and culture. New organizational forms such as “omni-commons” need state recognition and support so that they can incubate and host commoning. An omni-commons is a administrative and financial organization such as the Omni-Commons of Oakland, California, or Cecosesola of Venezuela, which provides the overhead systems and infrastructures for small-scale commons to start up and function more readily. Law for the commons is needed first to decriminalize commoning in certain instances, such as seed-sharing or customary land use. Law for the commons is also needed to affirmative support acts of commoning, by giving the “vernacular law” of social practices formal state recognition. Law needs to recognize the “unofficial” social norms, procedures and customary institutions that peer communities devise to manage their resources. The various land commons in Africa need to have their customary rights recognized in law, for example. Creating Law for the Commons can also help bridge the alarming gap between law and legitimacy – an idea that I learned from legal scholar Étienne Le Roy. One of the big problems today is the gap between the formal strictures of state law and bureaucratic rules adopted by political and corporate elites – “legality” – and the experiences, norms and practices that ordinary people regard as legitimate. We will never make progress against climate change or many other problems if people do not feel that state law is legitimate or that they are excluded from playing a meaningful role in the laws that govern them. 4. Reinvent finance for the commons. This, too, is a huge topic, but one that deserves much greater attention. To support commoning, we need new sorts of finance that can share equity among people as an alternative to conventional debt-driven investment. The Commons Strategies Group recently held a three-day workshop on “Democratic Money and Capital for the Commons” to explore the range of options, from public banks and social and ethical banking, to new forms of co-operative finance, digital currencies that use blockchain software from Bitcoin, and even “quantitative easing for people,” and not just banks. There are some interesting experiments going on to raise money for commons-based guilds using redeemable stock shares with caps on the return on investment. This would allow equity to be raised for commons-based ventures without forcing them to surrender control to venture capitalists; they could remain co-operatively run. We need new sorts of macro-finance to accelerate transition strategies to a new economy. One great idea is for “transvestments” – a term coined by Dmitri Kleiner to describe investments in technologies and projects that help us move toward the commons paradigm. 5. Leverage sharing on open networks to support commoning (not Uber-ification). There are huge opportunities to reinvent the idea of development through digital technologies and open networks. But a key question that should be addressed is whether the design and benefits of the innovation will be monetized and siphoned away to Silicon Valley investors – or shared by participants themselves? The tech world often talks about the virtues of “disruption” – but much less about how social needs and the public interest will be fulfilled. State policy and development policy could play a critical role here by providing infrastructures, technical protocols and standards designed to support commoning. We’ve seen, for example, how people in Austin, Texas, built their own smartphone app that will enable co-operative benefits and better public protections than the app that Uber was insisting on using. There is a burgeoning new movement called “platform co-operativism” seeking to spread this ethic as a feasible alternative to winner-take-all, highly extractive business models such as Uber, Airbnb and Task Rabbit – business models that lead a “race to the bottom” to extract value from the workforce rather than pay living wages. The big-picture economic story here is the growing structural reliance on social sharing and collaboration, as documented by commentators like Jeremy Rifkin, Yochai Benkler, Donald Tapscott and Michel Bauwens. This trend could result in a kind of neo-feudalism led by corporate giants – or to a democratization of governance and production. We could have large telecom monopolies creating artificial scarcity and high prices – or commons such as Guifinet, the self-organized wifi service in Catalonia, perhaps the largest community network in the world with its plentiful bandwidth for everyone. State leadership could help us navigate a transition to this sort of world, where commons using network platforms could manage all sorts of knowledge-sharing, open-book accounting and commons-based peer production. Preliminary estimates by the P2P Foundation suggest that the mutualization of knowledge and production infrastructures could produce an “80-80” improvement – 80% less physical matter and energy would be needed to produce 80% of what we produce right now. Citizen-science could improve reporting about all sorts of environmental problems in tandem with state bureaucracies. Open design/local production communities like Farm Hack is already producing cheap, modular, locally sourced agricultural equipment for rural regions around the world. 6. Rethink state power to decriminalize and support commoning. It is an open question how the state may need to change in order to accommodate, if not support, commoning. Given the state’s close alliance with capital, there is certainly little appetite for exploring post-capitalist, post-growth forms of provisioning. Moreover, as my reference to the Napoleonic civil code suggests, the state and commons do not have a formal or natural juridical relationship. This means that the claims of individual property rights generally override the concerns of the commons and collective human rights. That said, the relationship between state power and commoning is very complicated. It is possible to imagine the state developing new structures to support commoning, just as it is in Bologna, Barcelona and Seoul. (Interesting that cities appear to be in the vanguard of redfining state power and commoning.) Clearly one important tension between the state and commoners is the shrinking capacities of centralized bureaucracies in the face of open networks and social collaboration. David Graeber brilliantly critiques the limits of bureaucracy in his book The Utopia of Rules – and astutely that the left has no substitute, humane system to propose for bureaucracy. There are many unresolved questions, however. How should boundaries around commons be drawn, and what new tensions might these boundaries engender? The German environmental scholar Wolfgang Sachs pointed out to me that “a commons perspective has to struggle with the neoliberal economy on the one hand and nationalist movements on the other.” Commoners may celebrate diversity, localism and participation, he said, but that does not resolve the age-old tensions between natives and strangers, traditionalists and cosmopolitans, and authoritarianism and social justice. My provisional response to this is that the commons has transideological appeal and does not fit neatly into the left/right political spectrum. As my colleague Silke Helfrich points out, conservatives like the tendency of commons to promote responsibility; liberals and social democrats are pleased with the focus on equality and basic social entitlement; libertarians like the emphasis on individual initiative; and leftists like the idea of limiting the scope of the market. In this sense, champions of the commons cannot be neatly labeled. I think that Pope Francis was aware of this, too, in his manifesto about the environment and poverty, Laudato si’, in which he stresses the value of our common wealth beyond market and state and offers a vision of human diversity grounded in unity. 7. Learn to live with ambiguity, paradox, and experimentalism (because we are living in a transitional period). We must learn to live within two very different socio-economic logics and construct practical transitions that strives to sharpen its vision and commitment to commoning – while acknowledging unavoidable constraints and paradoxes. 8. Commoning is not just for “developing” countries. 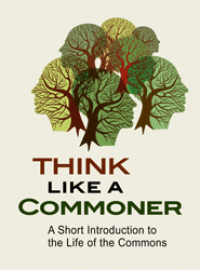 As should be obvious by now, commoning holds many important lessons and possibilities for those of us living in “advanced” industrial societies. In fact, there is an enormous amount of activity related to the commons in Europe these days – from the European Parliament’s task force on the commons to festivals in Greece, Italy and France, to books, workshops, and grassroots projects that policymakers have not yet discovered. All of these offer some promising new opportunities for North/South cooperation if not solidarity. So what does all of this add up to? I’m not prepared to make grand predictions that the commons can usher in a political revolution at the global scale, as Dardot and Laval argue in their book Commun. I wouldn’t rule that out, but for now I prefer to think more modestly of the commons as an indispensable complement to market and state with enormous potential for catalyzing transformations at both macro- and micro-scale levels. This will require that we imagine and invent new sorts of governance institutions that go beyond the nation-state and international treaty organizations: a rather ambitious vision indeed. Still, we need to start exploring such ideas. I lay out some of my speculations on this topic in a recent essay published by Friends of the Earth U.K. called “Transnational Republics of Commoning: Reinventing Governance Through Emergent Networking.” In the next few days, just north of Paris, I am co-hosting a workshop with international law scholars and activists to try to imagine what commons-based systems of governance might look like for managing large-scale ecological resources such as regional ecosystems, oceans or the atmosphere, which are comprised of so many smaller-scale systems. Let me close with two quotes – the first a warning, the second, an inspiration. A proverb of the indigenous people of southwestern Colombia warns: “The word without action is empty, action without the word is blind, and action and the word outside the spirit of the community is death.” Of course, many of us are on the quest to figure out precisely the opposite -- how to integrate word, action and community, and thereby create flourishing commons that can unleash cascades of creativity, aliveness and innovation. That is precisely what we need right now. The inspiration comes from the anonymous Invisible Committee in France, which wrote: “Revolutionary moments do not spread by contamination but by resonance….It takes the shape of music, whose focal points, though dispersed in time and space, succeed in imposing the rhythms of their own vibrations.” Listen closely and you will hear the music of the commons! Thank you for this post which is my first contact with your work. It has been a long time since I have enjoyed reading an essay as articulate, informed and committed as this finely wrought piece. 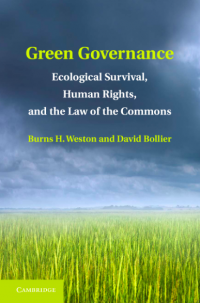 It offers a superb explication of the notion of commons and how this notion offers a workable alternative to the political/economic systems under which the world presently strains to near breaking point. I have especially appreciated the range of sources that have informed your own political and philosophical position. It was particularly gratifying to see mention of E.F. Schumacher whose work continues to hold perennial insights. You have presented a vision in which the unaccountability and hubris that presently hold states and markets at the centre of governance structures can begin to transition to more autonomous community-based models whereby participation and cultural presence can be reclaimed. As was often voiced by Thomas Berry, all humanly-induced change begins with clear envisioning. The many examples of successful commons projects raised in this essay are a powerful source of hope that things can, in fact, be turned around in a world that seems dominated by unreachable and unflinchingly destructive political and economic ideologies. And this is done in a way that fully acknowledges the magnitude of the project that confronts all who would serve as skillful and compassionate agents of change in the present climate. I have also appreciated your calls for cultural restoration and reintegation of the moral and spiritual dimensions that were so hastily discarded in the wake of so-called post-Enlightenment "development" - those qualities that enable us to participate more intimately and relationally with the world and with each other. And it is heartening to know that your words are matched with action, as is reflected in your concluding comments regarding co-hosting a workshop with international law scholars and activists exploring commons based governance structures to protect both human communities and regional ecosystems. The ideas expressed in your essay represent powerful models for the eventual healing of the earth and her communities by recreating community - if we can manage to get through the death-throes of a pathologically destructive global economic, political and military system that has completely lost sight of the sources of life and love. Thank you David.